Hello! How was your Christmas? I hope it was wonderful and filled with peace, love and joy through the presence of family, friends and good food. My Christmas was enjoyable and did involve a few days with my family and friends, for which I am most grateful. We certainly enjoyed a feast for Christmas lunch, and subsequently Christmas dinner, Boxing Day lunch and Boxing Day dinner as we worked our way through all the leftovers! This seemingly endless supply of food was nothing to feel guilty about, as it was a most nutritious and delicious feast. Our menu included ham, smoked salmon, smoked trout, prawns and my five-spiced barbequed pork served alongside roast pumpkin, roast potato and roast capsicum, potato salad, zucchini salad and seasoned carrots and corn. For the highly anticipated dessert, I made Teresa Cutter's Baked Christmas Pudding and my oh my was it deeeeelightful, I would highly recommend!! I also made a Mango and Raspberry Trifle and of course there was a fruit platter which is ubiquitous at all my events! We ate our fill, but everyone commented on how tasty everything was, acknowledging the flavours and textures of the meal rather than simply mindlessly stuffing ourselves silly. One dish (apart from the pudding!) which was a real hit was my zucchini, mint and goat's cheese salad. Everyone thought it was a most refreshing salad and a versatile way to utilise the often overlooked zucchini. I encourage you to try this salad as it serves as a reminder that a 'salad' is not simply just the old lettuce, tomato, cucumber combination; even your traditional 'cooked' vegetables can be incorporated into salads to diversify your vegetable and nutrient intake over the warmer months. 1. Bring a medium pot of water to the boil. Slice the zucchini into pieces roughly 1cm wide, then cut in half lengthways. 2. Prepare the asparagus by snapping off the woody ends. 3, Prepare the snow peas by topping and tailing and removing any outer string. 4. Using the boiling water, steam or blanch the zucchini, asparagus, snow peas and baby peas for 3 minutes, then rinse under cold water. 5. Toast the slivered almonds until golden brown, using an oven grill or alternatively in a frypan over a medium heat. 6. Combine the spinach leaves, chopped mint leaves and onion in a large bowl. Add the cooked green vegetables. 7. Add to the greens the lemon juice, crumbled goat's cheese, nuts and pepper to taste. Stir well to combine ans enjoy! 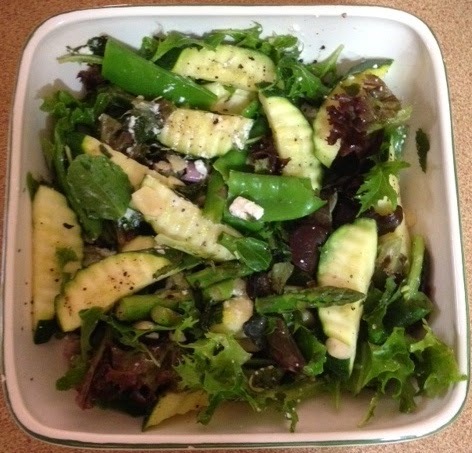 Minty zucchini salad, a great way to use the abundant greens from the garden! Nutrition Information per serve (4): Energy 570kj, Protein 8g, Fat 7g, Saturated fat 1.1g, Carbohydrate 6.8g, Fibre 5.3g, Sodium 44g. Cranberry, Seed and Dark Chocolate Cookies.